Be interesting or interested in something else. I know that sounds like the lamest advice in the world, but this class thrives on you. The class can be really fun if you let it be. So post about things you like, things you don’t like. Turn the assignments to pertain to your interests (like Harry Potter being my one true love) so that you have fun making them. So few other classes let you be creative like this. So take advantage of that. Don’t let this class just be another filler class, but get into it. It’s so much more fun that way. If you try, it’s worth it. This kind of goes back to advice number 2, but this class is worth trying in. There are some assignments you can whip together without really thinking it through, but why would you? The assignments are really fun and let you explore the internet and social media, things you use all the time. Let Jim Groom help you. The man never sleeps and eats this stuff for breakfast. He loves helping students because he wants you to succeed. He’s not one of those professors who will leave you out to dry if you don’t get it. Tweet him, e-mail him, tweet him, go talk to him in person, or most effectively-tweet him. Stay on top of things. This stuff takes time to do. Our group’s video essay was a solid 4 hours a night every night for a week and a half to two weeks. We went a little above what some other groups did, but it turned out so extremely well. Other assignments take 5 minutes max (the daily shoot ones). Help each other. HELP EACH OTHER! Jim Groom is really helpful and totally willing to answer questions, but there are times when I’ve just needed to text Megan McMillan and say “Help me! My old man-ness is showing!” If you’ve figured out audacity, help your friend figure it out as well. Some things can be really tricky and you just need someone sitting right there to help you out. This class is what you make of it. If you want it to be a filler class that you do just to get by, then it will be just that. If you want it to be fun and creative and stretch you a little, then it will. I have enjoyed this class so much and being able to say, “Yeah, I know how to do that,” is the coolest feeling ever. Miña and Charles both recommended this class and you can be sure that I too will be telling everyone I know to take this class, too. So, I’m not entirely sure this is really a mashup, but it is in my mind, so I’m going with it! 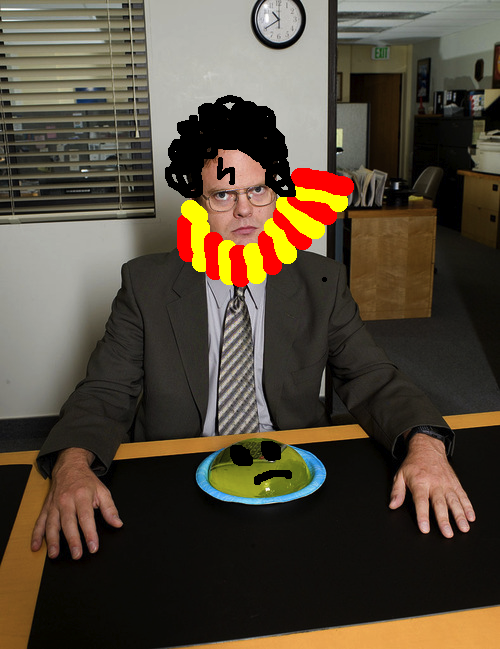 Mash-up of The Office and Harry Potter: Dwight Schrute as the Boy Who Lived! Yeah, that’s right. Dwight K. Schrute would be the Boy Who Lived, begrudgingly saving the world from Lord Voldemort. The jello with the stapler is actually a horcrux that Jim made (because he would be Lord Voldemort). I kind of feel like this is some weird fan-fiction going on. Anyway, here is my picture mash-up! The thing around his neck is a Gryffindor scarf. And the jello has a frowny face because it’s a horcrux. Ok, this has been ridiculous and I feel like I have my old-man-nature really showed itself on this assignment. I had a hard time with the movie getting on my computer and then saving it and then the actual talking part and then the uploading it to youtube bit. Gah. Well, vimeo worked wonderfully once I saw Kaitlin had used that as well. And it still cut off some of my closing comments, but here it is! My videoessay on Atonement directed by Joe Wright. Video Essay from Catherine Mohr on Vimeo. You may have noticed my lack of a video for the Video Essay assignment for our class. Well, that would be because I’m an idiot and didn’t save things correctly and subsequently, the project that I finished is back to the first scene. So, that little bit will be late(r than it already is) due to my inability to save. Go me. But, it will be finished either tonight or tomorrow. And hopefully the Reverend Jim Groom won’t fail me too badly *insert charming and convincing smile here. * I’ve had a rough time with this assignment (I found the webstory one easier than this) so this last little roadblock is just icing on the cake. Yay!! Ok, so last week we did the Webstory bit with changing of actual websites and such. 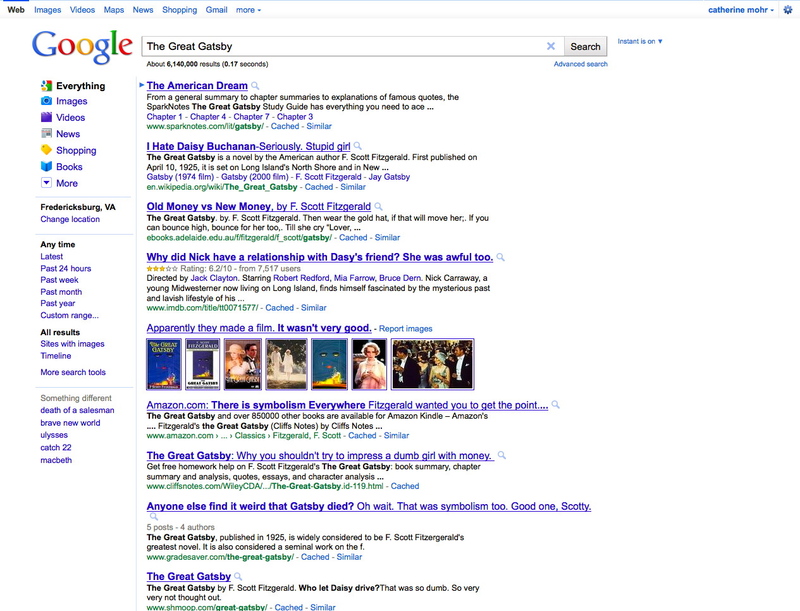 So, I applied that to Google to give some highlights from the story of The Great Gatsby. Such as how important symbolism and who even likes Daisy anyway? It’s a little big for the screen, but if I made it smaller it would be difficult to read. So! 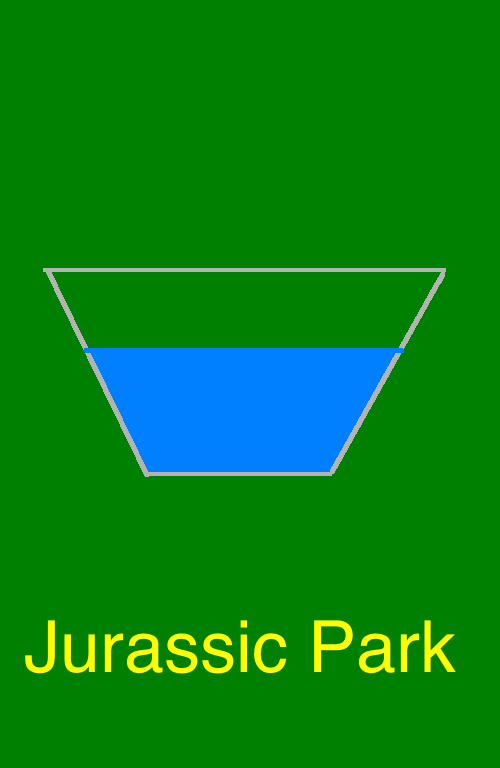 If you want to see it fully, click it and that will work. Now on to the video assignment!